Although fishing has been slow, those who did fish discovered the key was finding some clean water with little current. The calico and sand bass were usually found in the 10- to 15-fathom hard-bottom spots and along the edges of the kelp closer to shore. 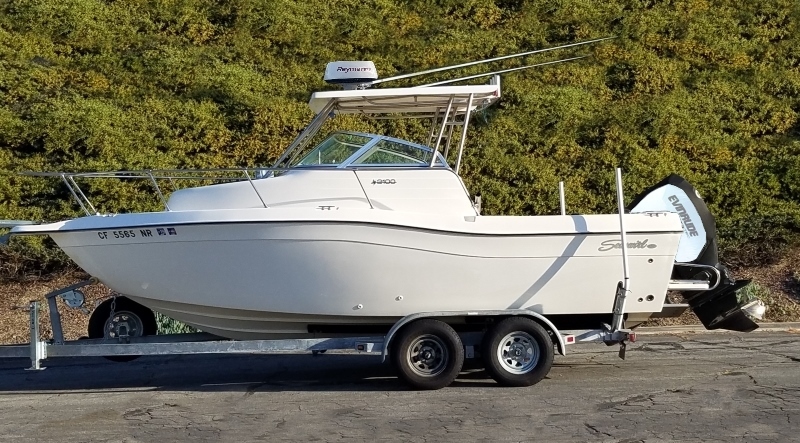 In addition, there have been a few sculpin, plus a pretty good chance of catching a few halibut drifting over the sandy bottom patches. Otherwise, there’s just not much going on. 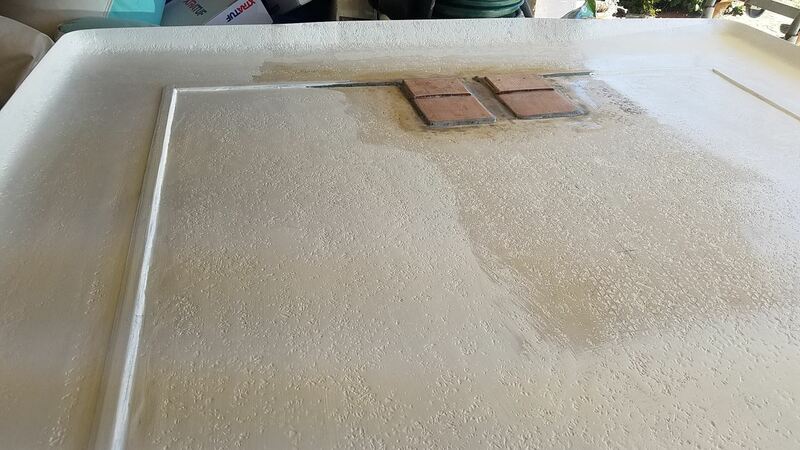 The water has cleaned up a bit but for the most part, the yellows haven’t reappeared after the stretch of storms. Currently, “Whale Watching” is one activity that is allowing family and friends to experience the annual whale migration as they travel south from the Bering Sea, as well as viewing some whales escorting their babies north, already returning from the Baja bays where the calves were born. Both local pangas and cruisers are offering Whale Watching trips. 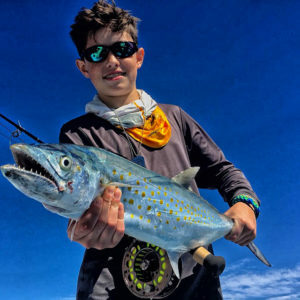 On the sport fishing front, bonito and mackerel, along with an occasional yellowtail seems to be attracted to the unseasonal appearance of the live bait schools in Todos Santos Bay. 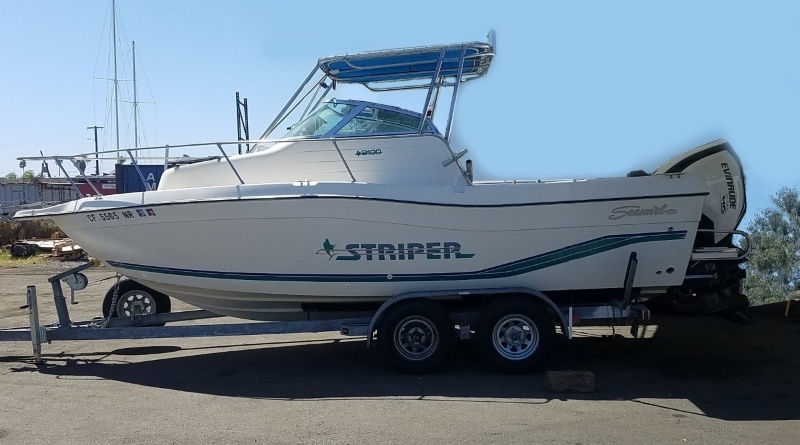 On my last day, Captain Juan asked if I would be interested in fishing the outside with him and a couple customers on Saturday. Once again, this was an easy decision. A bay trip in the Parker, now that’s style! 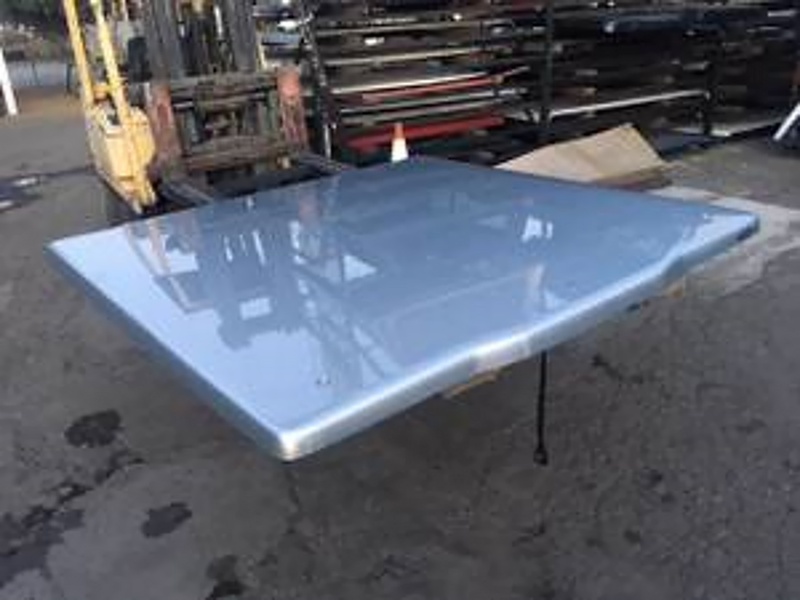 Gracias, El Capitan! We spent the day on the outside, hitting the high spots and looking for yellowtail. While things were quiet after the ringing in of the New Year, the north winds did their on-and-off dance and mostly local anglers took advantage of the lulls in-between. The anglers that did go out were rewarded with sierra and a few smaller yellowtail as well as grouper, cabrilla and spotted bay bass on the bottom. 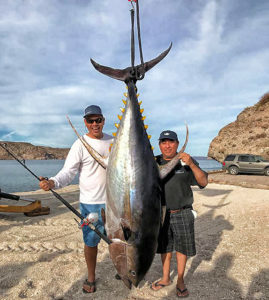 When commercial fishermen from Agua Verde lost a cow-sized yellowfin tuna off nearby Isla Santa Catalan while spotting others crashing at dusk on Jan. 5, they shared the knowledge – resulting in a valiant angling effort for huge Loreto yellowfin and a pending IGFA record. Robert Ross, an American off-road racer and resident of nearby Playa San Cosme, with sons-in-law, Jorge Lazo, Tijuana, and Jay Yadon, owner of Outpost Charters in Loreto, together with deckhand Tony Winkler, responded to the news, setting the stage for a three-day, tuna-chasing marathon that would include six hookups and four landed. 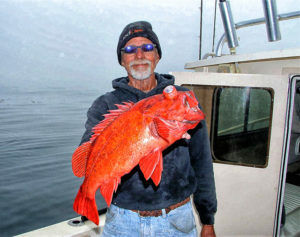 The two largest were caught by Lazo on an Accurate Valiant BV2-800 reel loaded with 50-pound P-Line, 100-pound Hi-Seas fluorocarbon leader with a Mustad 6/0 hook on a Seeker rod. The biggest weighed 424.6 pounds, topping the current IGFA record of 385-pounds, 12 ounces by a click less than 40 pounds. Lazo’s second tuna weighed 319 pounds — a two-day fish total for both the angler and his Accurate Valiant BV2-800 of 743.6 pounds. Firecrackers and tuna is the talk in Town this week. Close in we have the continuation of some good winter fishing as the North Winds allows. Outside, way out, we have had a handful of big yellowfin tuna landed and that started everyone talking. 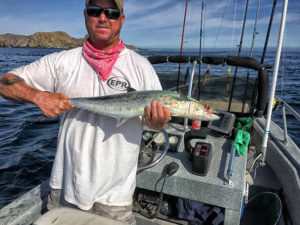 Coronado Island and north to Candeleros has been the easy, go-to spots for small yellowtail and a good selection of pintos, cabrilla and reds. 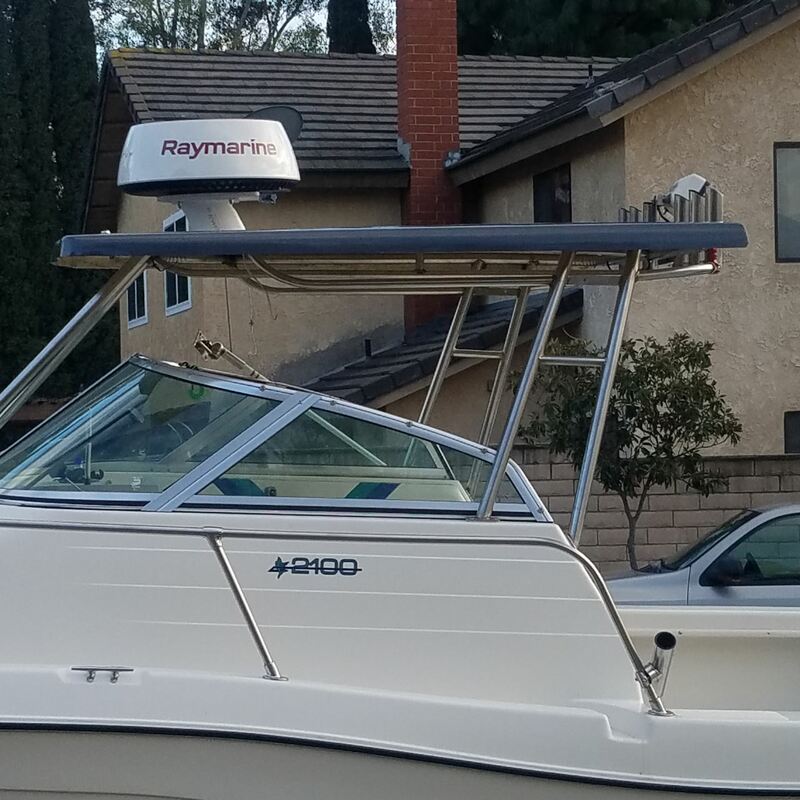 Tip for the tuna seekers: never mention the word tuna or it’s Spanish translation over the radio because the commercial net boats are listening! 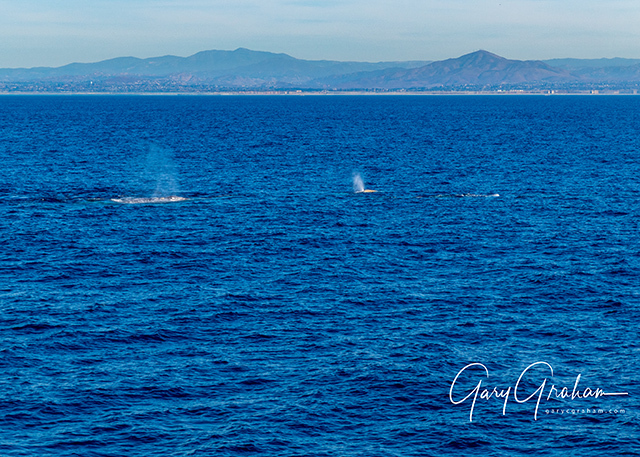 Whales just starting to enter the bay. First mother and calf seen yesterday with several others ready to enter the bay. Outside the marlin have resurfaced in good numbers. Outside on the outer banks, yellowtail, bonito and skipjack are everywhere with a few yellowfin mixed in. Bay fishing remains good for those who can get live shrimp. 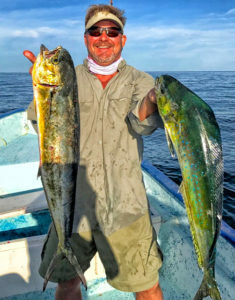 Paul Melewski from Colorado was out fishing for some snapper, pargo and cabrilla over the reefs in Bahia los Muertos while staying at Rancho Costa near La Paz and instead hooked up this pair of dorado. 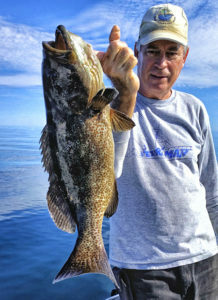 Not many folks have been fishing recently which is typical now that the holidays are over. Most of the holiday visitors have left and the town is mellow once again, not that it has ever been very bustling. But, by the same token, there are not many folks fishing either. n, a long-time employee of Rancho Buena Vista Hotel for more than four decades, suffered a heart attack and passed away. 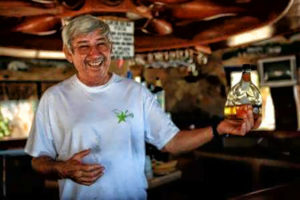 Tony was a Baja Icon, with his friendly smile and kind disposition. Almost everyone who was ever a guest at RBV will remember Tony who went beyond his job description in his eagerness to help with any request. Rest in Peace, Tony. The world was a better place for having you in it. 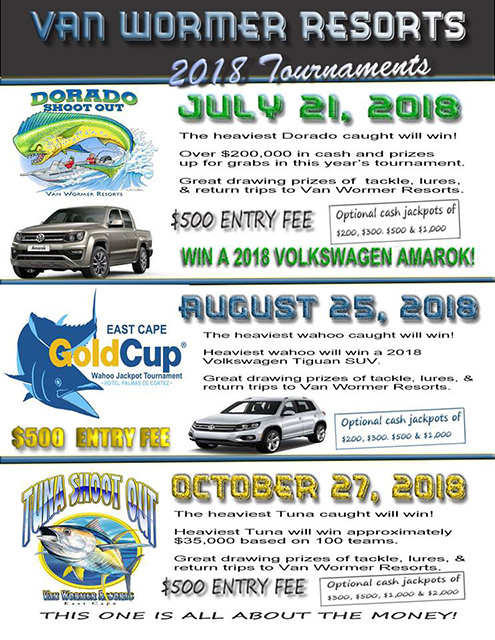 Never too early to set the dates aside for these popular East Cape Tournaments. East Cape rock & roll!! Nice catch today on JUL KATE with Captain Luis Jesus Araiza and deckhand, Andrés Cota Verduzco. 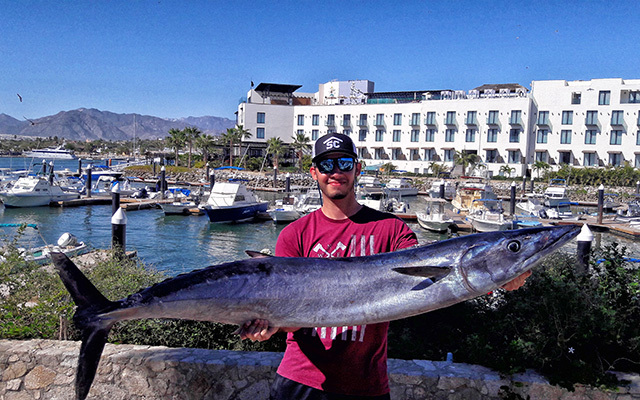 There have been ample live sardina and caballito available; the larger baitfish, caballito, is being found inside the marina area, while sardina have been schooling along the rocky beach stretches from Palmilla to Cabo Real. Offshore from the hotel zone, there were concentrations of mackerel and sardineta. 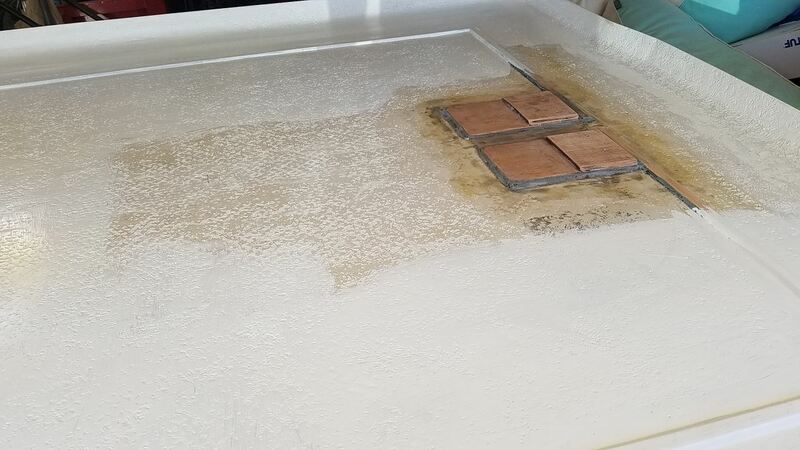 Water temperature is now in the 73- to 75-degree range, as a cooling trend has continued; the inshore areas are no longer as clean and blue … they are more greenish with the current starting to push in. 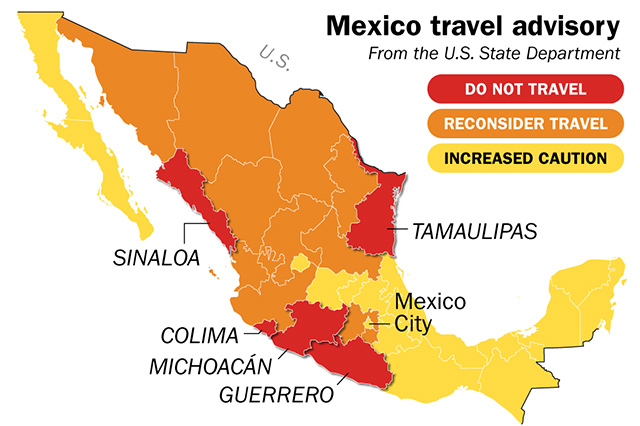 The main target species have continued to be dorado and yellowfin tuna. 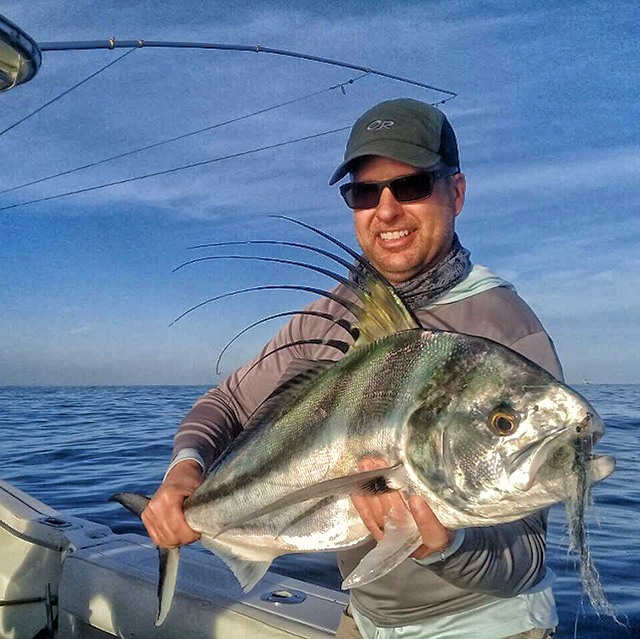 Recently, the yellowfin tuna action has been great and drift fishing with fly-lined bait has been the main technique producing 15- to 25-pound fish; more recently, the action has rolled over with more skipjack showing as the winds increased. 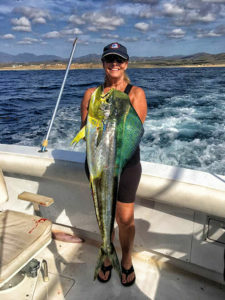 Dorado action has been good even though most of the dorado are not giants, averaging from only 5 to 15 pounds. They have been found in smaller-sized schools along with the yellowfin tuna, closer to shore, more often within a mile of the beach. They have been biting a variety of baitfish, with a smaller percentage being caught on trolled lures. Wahoo action has slowed, with only a handful of these fish reportedly hooked recently. The combination of cooling currents, the water becoming greener, and it being very late in the season now, are all factors. The billfish action off San Jose del Cabo has come to a standstill, and the greener water has seemed to be a factor. 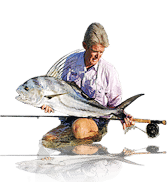 Along the shoreline, there were more juvenile-sized roosterfish showing; anglers are encouraged to release these smaller fish at every possible chance. 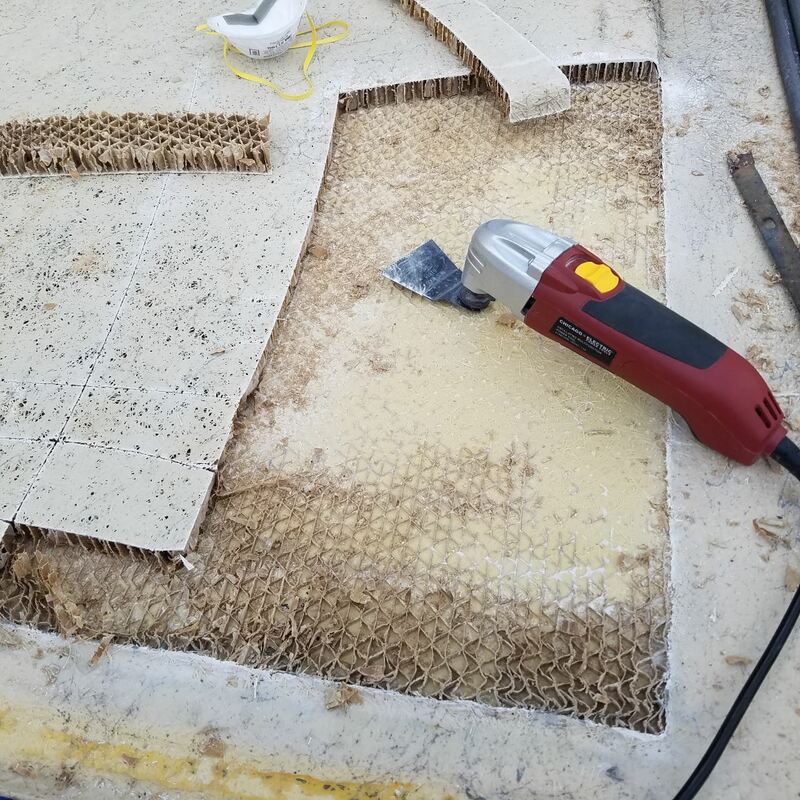 Jan. 2/18 – The Loynes family, Mike, Linda, daughter Leah and son-in-law William, son Lucas and companion, Kimberly, fished Iman Bank with live sardine. They released 14 dorado, and kept 3 all over 30 pounds; released 7 tuna, retained 1, 51 pounds (Lobo got 4 more) 3 wahoo hit but no hook-ups. Jan. 4/18 – The Loynes family once again on the Inner Gordo Bank fished with chunk squid. 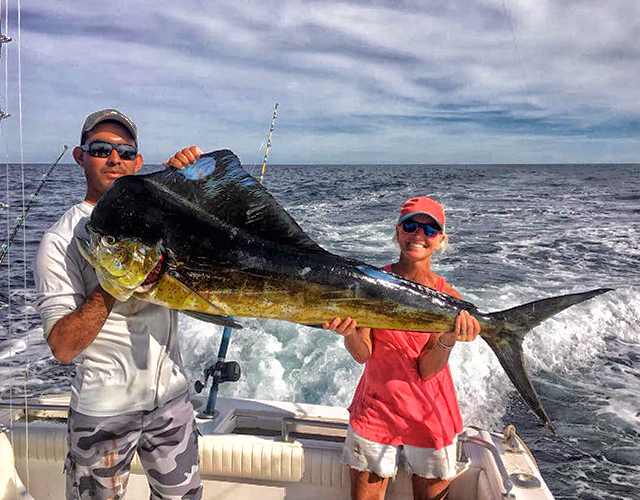 They released 9 dorado, retained 1, 27-pounder, released 11 tuna, lost one estimated at over 200 pounds, (Lobo got 3 more) 1 wahoo hit, no hook-up. Jan. 5/18 – The Loynes family (Happy Birthday, Mike!) fished 25 with Rapalas, 3 wahoo hits, 1 hook-up but it was lost at the boat; released 4 dorado. Hooked up “something BIG” with chunk skipjack. Species unknown. Had it on for 45 minutes and it broke 40# floro leader. Jan. 8/18 – Mike, Linda, Lucas and Kimberly. They retained the largest pompano caught in the last 25 years while waiting for bait … weight unknown. Released 3 tuna, retained 3 weighing between 45 and 55 pounds, released 2 dorado (one big bull estimated at over 50 pounds) all on squid chunk. Released 2 more dorado while trolling rapalas on the way back to port. Home before noon! Just spent three days with this amazing angler … Ben Welch. He is a very strong angler and is only 13 years old. I enjoyed guiding him for the past three days in Cabo. Great marlin catches out at the Finger Bank and Golden Gate, with all stripers and one blue caught this week and even more dorado; yellowfin tuna catches slowing down quite a bit and anglers having tons of fun with smaller gamefish like grouper, sierra and rooster fish, to name a few. Cabo Climate: Some scattered clouds for part of the week with other days sunny and clear skies and an average daytime temp of 80 degrees; nights at 63.7 degrees. Humidity ratio averaged 56.28%. Sea Conditions: Nearly flat-calm seas throughout the area with a gentle surface breeze from the westerly directions at about 7 mph. Sea temp from the Finger Bank, southerly across the Golden Gate and Jaime Banks all at 74 to 75 degrees. Cabo Falso to Gorda Banks and 15 miles above, all at 75 to 77 degrees. Best Fishing Area: The Finger Bank by far, with marlin feeders in every direction. El Faro-Cabo Falso, Jaime Bank, Pozo Cota, all were offering an occasional marlin. 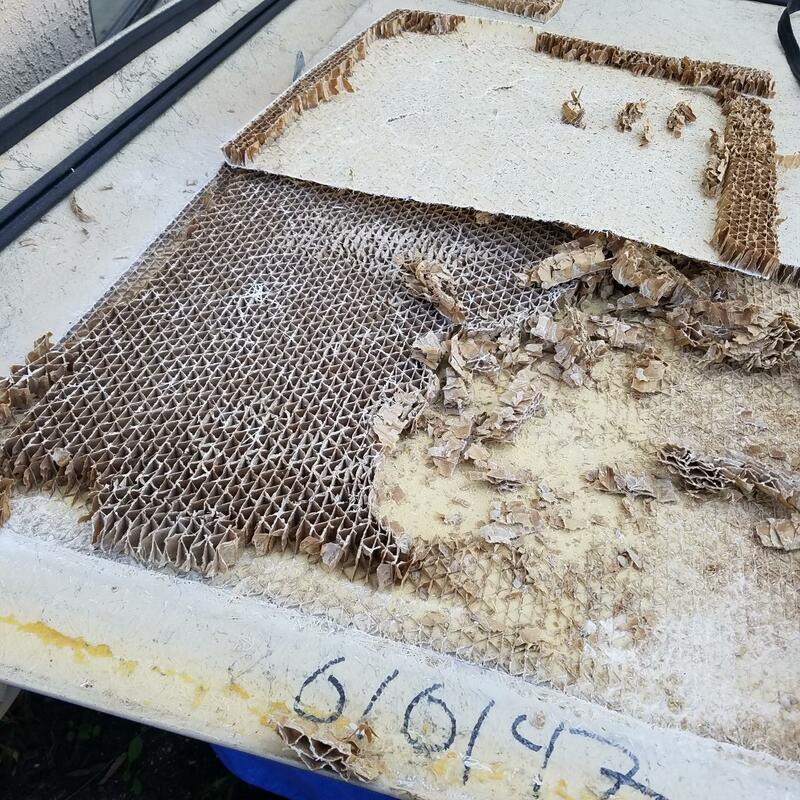 Best Bait, Lure: At the Finger Bank, almost anything that moved got bit and the other areas got bit on the rigged bait and live bait.